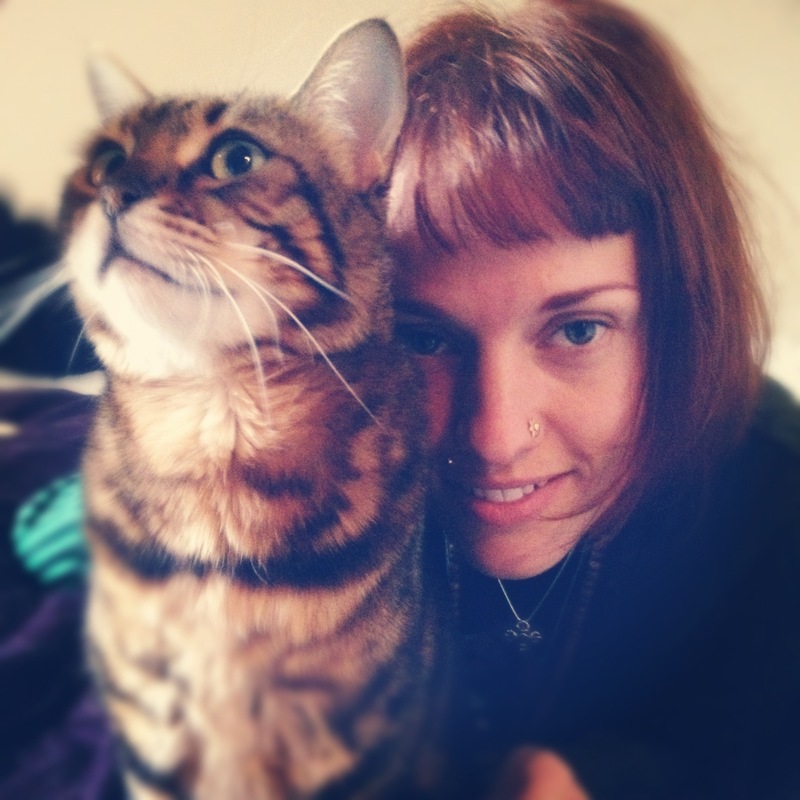 Craftivist Sarah Maguire remembers her first face-to-face experience of poverty in Indonesia as she reflects on why she decided to get involved in the Jigsaw project. My boyfriend Brian and I were tightly squashed into the back of a battered old three wheeler Tuk-Tuk, our backpacks awkwardly piled on our laps and digging into our knees. I apprehensively peered over the top of my bag, my eyes wolfing down every micro detail of of this new foreign land. We tightly negotiated through herds of people going about their daily business, forming a kind of organised chaos that would have made a London cabbie have heart failure. Our driver, a young man in his mid-20s, dressed in an ill-fitting shabby Manchester United T-shirt, cooly slalomed through the crowd, Tuk-Tuks, adults, children, and the odd farm animal all interweaving in some sort of choreographed dance. Occasionally our placid driver became perturbed and frantically honked his horn, arms flailing, signaling for people to move out of his way. One lady sauntered along, in absolutely no rush as she crossed his path, shuffling in her worn out flip flops, the bottom inch of her batik dress caked in heavy road dust. a bag, his other made an eating gesture. I struggled to pull some money from my bum bag that was jammed between my belly and my rucksack. I no sooner had handed him a couple of crumpled notes before a petite lady with a beautiful face holding her baby close to her chest in a selendang (sling) silently pushed her own open hand through the window. Within seconds the word had spread and there was a small crowd huddling around us, all expecting a few rupiah each. Our driver began to shout at them, waving his hand, gesturing for them to move and leave us alone. With a flushed face he leaned forward into the steering wheel and stepped up his effort to promptly get us out of there. We were stuck behind a skeletal mule that was weighed down by baskets of bananas, dawdling in protest against his forced labour. I buried my head deep down into my backpack, hiding my tears from the desperate needy faces. shacks with no electricity. The real culture shock was coming back to Britain and hearing the daily moaning and complaining from people that actually did have a clean toilet, fresh water in their taps and a nicely packed lunch in their bag. I have remained ever loyal and connected to Asia and find myself going back time and time again. I am an artist and work in different canada online pharmacy free shipping mediums. I’m predominantly a musician/songwriter and writer, but I like to think that I can make almost anything with a pair of scissors, paper and glue. In the last couple of years I have found great joy and meditation in hand embroidery. Since that first trip to Indonesia the East has influenced my thoughts and choices everyday. Two years ago, after having a Hindu wedding in Rishikesh, India, I became heavily involved in studying Gandhi and his teachings of Ahimsa (non-violence) and Satyagraha (insistence on truth) and this lead me to making changes in every area of my life. Non-violence has opened my eyes to the plight of all beings on this earth and every day I try to be mindful and live in a way that causes as little harm to the earth and other beings as possible. I guess I would call myself a lifestyle activist. It is easy for me to feel powerless in the fight against hunger when I hear about the millions of men, women and children who are facing this catastrophic reality every day. But I do believe that we can all take our power back and, as Gandhi said, “be the change we want to see in the world” by making compassionate and ethical decisions about how we hoose to live and treat one and other. For me one of those decisions was to make a piece and add my voice to the craftivist jigsaw project. 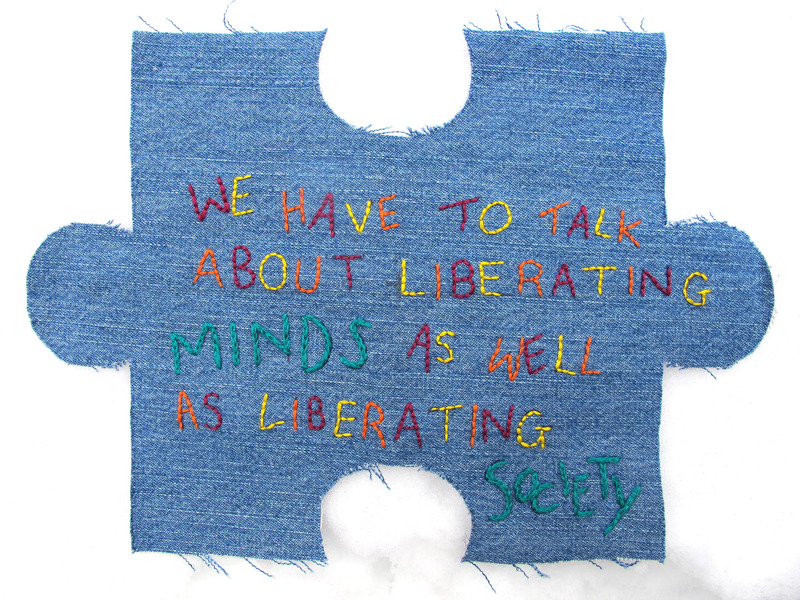 The quote that I chose to stitch on my piece is by the political activist and scholar Angela Davis: “We have to talk about liberating minds as well as liberating society.” Angela teaches that to solve social justice issues we have to “hone our critical skills, develop them and implement them”. Whenever I hear this it reminds me that I need to work on changing myself before I can expect to change society… and that I am an integral piece of the greater puzzle. Every small act can make a big difference, whether its what you buy, what you wear, what you eat or what you stitch! #imapiece. What a lovely post, Sarah! Well done! Why thank you Betsy I am honoured that you like it as I am a lover of your amazing thought provoking work!! what an gorgeous and moving piece of writing, Sarah Maguire. This is so great to see and read– THANK YOU!!! Go Sarah! … And Sarah! I hope we will all think and know this way one day…the main point for me being that we must all be loving towards all creatures, and if we truely would like to see a change, cutting our meat consumption to feed the world on a plant based diet really must be the way!